Twists and wraps each nappy to lock in odour Antibacterial film kills 99 per cent of germs on conta..
1. Plastic 2. Imported 3. Large capacity holds up to 75 diapers 4. They are odorless and easy to .. Individually wraps and seals away dirty diapers The bags are durable, easy to tear and are even.. Clips onto diaper bag or stroller Individually wraps and seals away dirty diapers Lightly sce.. The most practical solution for disposing of used diapers. These diaper bags have a sweet scent and .. 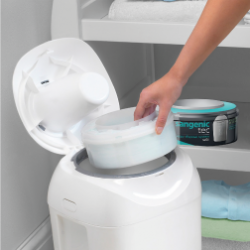 The enhanced sangenic tec nappy disposal system from tommee tippee is the only system to lock in odo.. The enhanced sangenic tec nappy disposal system from tommee tippee is the only system to lock in o..